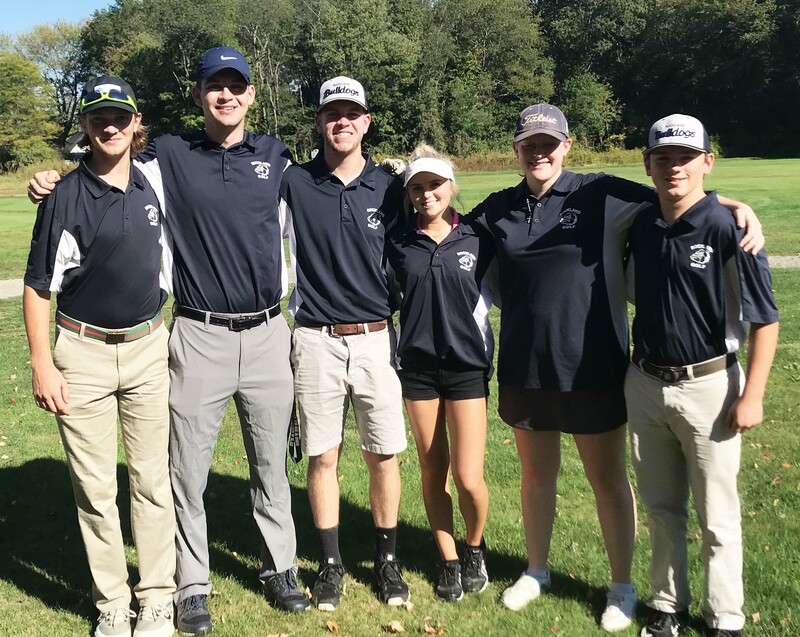 As the golf season got underway the Rockland High School golf team made people take notice with a winning streak of four games. One of Coach Brian Smith’s goals at the beginning of the season was for “the team to compete and improve and give 100%” He was hopeful that would result in wins and that the players would be having fun. Mr. Smith also said that all the players on the golf team look up to him literally because at 6’6 he is the tallest player on the golf team and possibly the whole school. Mr. Smith brings a lot of experience to coaching the team. He says he learned how to play golf by “playing with his dad and brother growing up.” This really helped him because now he is skilled enough to teach students here at RHS. Another thing that Mr. Smith stated was that all the freshmen on the team are getting along well with the upperclassmen. One of those freshmen who stands out is Steve Tutkus who is playing well, according to Mr. Smith. The golf team had a nice win over Abington 129-68 on Monday, September 25, making the team’s record 4-3. Then they defeated Middleboro on Weds. 116-93 making the record 5-3. The Bulldogs were led by Erik Wahlstrom and Chase McDonald. Also winning for Rockland were Aiden Glennon, Peter Kohler, Devin Gallagher and Eden Dalton. The Dogs’ evened their record at 7 wins, 7 losses on Oct. 16 with a win against South Shore Vo.Tech. They play Abington on Tuesday.